Tricuspid atresia is a form of congenital heart disease in which there is atresia of the tricuspid valve. This results in an absence of right atrioventricular connection. This in turn results in a hypoplastic right ventricle. 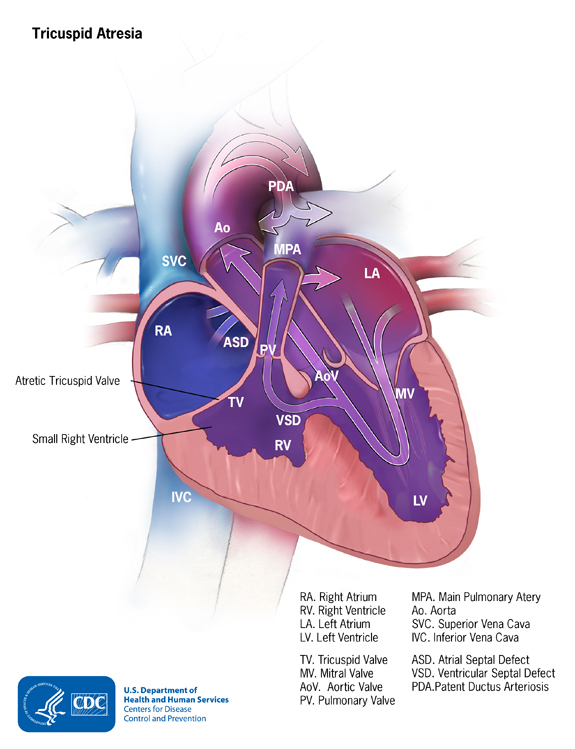 Patients with tricuspid atresia almost universally have an atrial septal defect which an obligatory right to left shunt (as systemic venous return cannot travel across the atretic tricuspid valve). In addition, the arterial connections may also be abnormal. Most commonly with tricuspid atresia the great vessels are normally related (TA with NRGV). This means that the pulmonary artery arises from the hypoplastic right ventricle and the aorta from the left ventricle. A ventricular septal defect (also referred to as a bulboventricular foramen) is required to ensure flow into the hypoplastic right ventricular chamber and subsequently to the lungs. Too large of a VSD may result in too much pulmonary blood flow (pulmonary overcirculation). A small restrictive VSD may result in too little pulmonary blood flow (cyanosis). Another variant of tricuspid atresia is called tricuspid atresia with transposition of the great arteries. In this variant of tricuspid atresia, the aorta and pulmonary artery are transposed. The aorta arises from the hypoplastic right ventricle and the pulmonary artery from the left ventricle. A ventricular septal defect (also referred to as a bulboventricular foramen) is required to ensure flow into the hypoplastic right ventricular chamber and subsequently out to the systemic circulation. A small restrictive VSD may resuilt in too little systemic blood flow (systemic hypoperfusion) and may be associated with other coexisting left sided obstructive lesions such as coarctation of the aorta. In addition, this variant of tricuspid atresia often results in pulmonary overcirculation as the pulmonary artery arises from the left ventricle and receives unrestrictive pulmonary blood flow from a systemic left ventricle.